JKCET Admit Card 2019 has been released on 15th April 2019 through online mode. Jammu & Kashmir Common Entrance Test is conducted by Jammu & Kashmir Board of Professional Entrance Examinations (JKBOPEE). It is a state level entrance exam which is organized once in a year. It offers admission in various colleges of Jammu & Kashmir state in the field of Engineering. Every year numbers of candidate appeared in this examination. Candidates can get complete details of JKCET 2019 Admit Card from this article. JKCET 2019 Admit Card has been released on 15th April 2019. Click here to get admit card. Candidates are required to affix recent passport size photograph on electronic admit card downloaded by them. On the day of the exam, candidates should carry any one of the photo ID proof, i.e. Election ID card/Aadhaar card, PAN Card, Driving License, Photo ID issued by concerned school/college/Employer, passport, etc. Candidates those successfully submitted the filled-in application form can download their admit card. 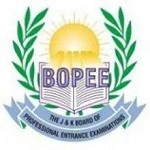 JKCET Admit Card 2019 can be downloaded from the website of BOPEE. It is mandatory to paste the photograph on top of downloaded electronic admit card if it is not available in downloaded admit card. It should be attested by the Gazetted officer. The admit card contain the venue, exam date, exam center and subjects. A candidate will be allowed in examination center, only if he possesses a have valid admit card. Candidates have to carry one of the Photo Id proof in original for the identification of candidates in the entrance test. Photo ID issued by concerned college/Employer. Note: Do not bring any kind of electronic gadgets along with admit card. Also, do not carry any kind of study materials and log tables in the examination hall. The JKCET entrance examination will be held on 21st April 2019. Candidates can download JKCET Admit Card 2019 from 15th April 2019 on the website. The result will be declared in May 2019 through online mode. Qualified candidates will be called for counselling which will be organized from the fourth week of June 2019. Candidates Must preserve the admit card till admission in the institution. Go to the official website. (Link is provided here). Fill your “Application Number” & “Date of Birth”. Then, click on the “Login” button. Download it and keep a printout copy of it for further procedure. 09:55 AM Reporting in the examination hall. 10:00 AM The invigilator will verify the candidate’s identification with the photograph pasted on admit card and attendance sheet. 10:15 AM The authority will be provided the OMR answer sheet and they will be allowed to read the instruction given on that. 10:25 AM The Question Booklet will be given to the candidates and they have to be entered the booklet number on the answer sheet. 10:30 AM Candidates will be allowed to open the question booklet and start attempting the questions. 01:30 PM OMR answer sheet will be hand over to the invigilator and leave allowed the examination hall after permission by the authority. If you have any query regarding JKCET Admit Card 2019, you can ask us by leaving your query in the comment box given below. When is the admit card for jkcet 2019 coming? Any ideas.. It will be released in the first week of April. Your registration would be successful if you have got a SMS of successful registration on your registered mobile number or mail in your mail id. No option to correct now. Sir admit card kab release ho raha hai? when will jkbopee release jkcet admit, as the releasing date was on 10th April? When will be the admit card be available? NDA exam and JKCET exam is on same day? Its april 11 & the admit card is not released yet. Do u have any information on the same! !